ROUGHLY two thousand five hundred million journeys are made by railway passengers in this country every year. If their journeys were made at a perfectly even rate, of so many per hour during the day, and of so many per month all the year round, the problem of handling them would not be so severe. But this is not the case. On the Great Eastern section of the LNER, whose busy London terminus at Liverpool Street, with its eighteen platforms, is shown above, the rush to the bracing East Coast nearly all comes between the middle of July and the middle of September. Not only so, but vast numbers of the holiday-makers persist in wanting to travel on Saturdays, which means a tremendous strain on the resources of engines, coaches and men during this short period. Then, again, suburban lines experience a tremendous rush in one direction while all the dwellers in the suburbs are going up to the City in the mornings, and then in the opposite direction when they want to be taken home at night. At such times handling the passengers quickly and smoothly calls for the utmost thought and preparation on the part of the railways. At tube railway stations, for example, the lifts which take passengers down to the railway level are rapidly giving place to escalators, which can deal with far more people at one time than can the lifts. 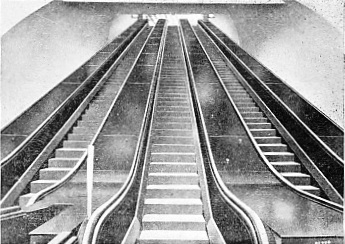 One of the latest triple escalators, at the Bank Station, is shown below; there are three moving stairways, one always going down, and another always up, while the third is “reversible”, going either down or up at will, according to the way in which the traffic is “flowing”. As far as possible, tickets on the tubes are issued automatically. 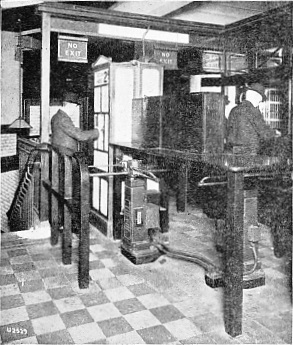 Illustrated above you see an entirely automatic machine; while elsewhere is shown the automatic assistance given to a booking-clerk. The tickets mostly asked for at this office appear in little slots, properly numbered, dated and clipped, as the clerk presses the right button; and the right-hand machine automatically gives out the correct change. Round him in the large cases are the tickets to more distant points, for which there is less frequent demand. Tube trains, too, are designed to accommodate the maximum possible number of passengers in a minimum space, with plenty of room inside for them to circulate, and numerous doors, opened and shut by pneumatic power in the latest types, for entrance and exit.